Canada’s carriers are expected to implement the CRTC-mandated wireless public alerting (WPA) service today, but not all LTE-capable devices will be compatible right away. As of April 6th, 2018, all of Canada’s carriers have a varying list of compatible devices. The list of compatible devices varies even among Canada’s three largest national carriers — Rogers, Bell and Telus. The list, in part, has to do with the fact that different carriers support different phones. Telus, for example, is the only Canadian carrier that sells the Essential Phone — hence the fact that Essential Phones with Rogers and Bell SIMs won’t be WPA-compatible right away. A Rogers spokesperson also told MobileSyrup that individuals with unlocked devices should contact their manufacturer to inquire about their phone’s ability to receive WPA notifications. It’s important to note that even though carriers need to implement LTE WPA capabilities by April 6th, systems won’t go live until later this year. Carriers will be conducting WPA tests between May 6th and May 12th, 2018. The CRTC hopes to have achieved 100 percent device coverage by April 2019. In the meanwhile, device-owners whose smartphones aren’t WPA-compatible can download services like Alertable — available on iOS and Android. Alertable connects to the National Alert Aggregation and Dissemination (NAAD) System that carriers will be using to deliver emergency alerts. Once the WPA system is ready for the public, LTE smartphone-owners will be able to receive region-specific emergency broadcasts including fire, natural disaster, civil disturbance, and environmental warnings. The NAAD is operated by Pelmorex Corp. — the same company that operates the Weather Network. 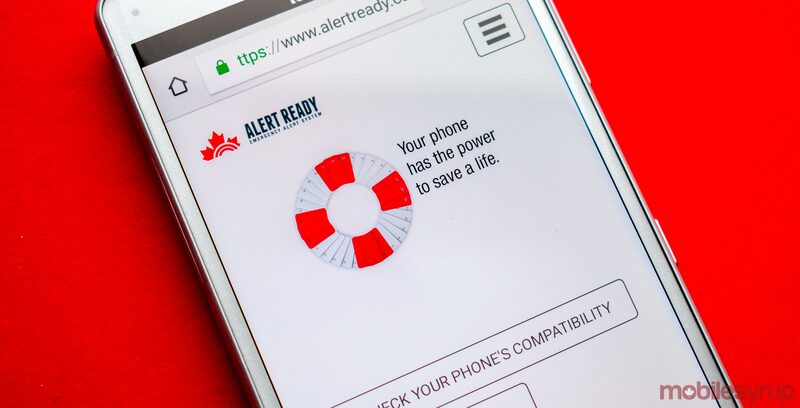 Using the NAAD, the Alert Ready system — designed in partnership with federal, provincial and territorial emergency management officials, as well as Environment and Climate Change Canada, Canada’s broadcasting industry and Pelmorex — delivers emergency alerts to Canadians.